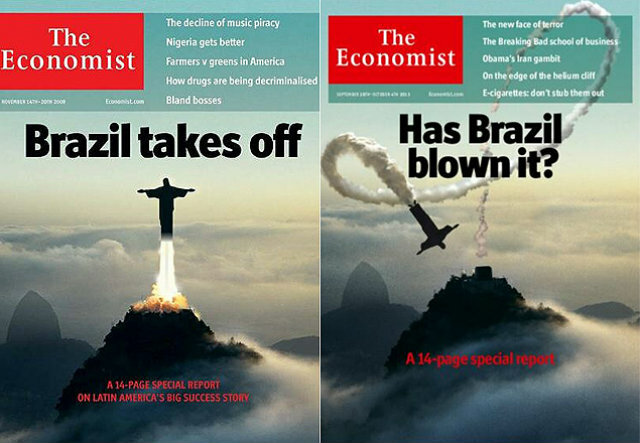 A edição desta semana do semanário britânico The Economist está IMPERDÍVEL. Há uma reportagem especial de 14 páginas, todas elas recheadas com fatos que colocam Dilma Rousseff em seu devido lugar: um fantoche completamente incapaz de administrar qualquer coisa. A capa da revista, aliás, faz uma menção a uma reportagem (também de capa) de 2009, na qual o tom era o inverso: ali, o semanário elogiava o Brasil, afirmando que ele estava “decolando” (take off). Agora, em 2013, a pergunta é: “O Brasil estragou tudo?”. Since then the country has come back down to earth with a bump. In 2012 the economy grew by 0.9%. Hundreds of thousands took to the streets in June in the biggest protests for a generation, complaining of high living costs, poor public services and the greed and corruption of politicians. Many have now lost faith in the idea that their country was headed for orbit and diagnosed just another voo de galinha (chicken flight), as they dubbed previous short-lived economic spurts. […] But Brazil has done far too little to reform its government in the boom years. It is not alone in this: India had a similar chance, and missed it. But Brazil’s public sector imposes a particularly heavy burden on its private sector, as our special report explains. Companies face the world’s most burdensome tax code, payroll taxes add 58% to salaries and the government has got its spending priorities upside down. Compare pensions and infrastructure. The former are absurdly generous. The average Brazilian can look forward to a pension of 70% of final pay at 54. Despite being a young country, Brazil spends as big a share of national income on pensions as southern Europe, where the proportion of old people is three times as big. By contrast, despite the country’s continental dimensions and lousy transport links, its spending on infrastructure is as skimpy as a string bikini. It spends just 1.5% of GDP on infrastructure, compared with a global average of 3.8%, even though its stock of infrastructure is valued at just 16% of GDP, compared with 71% in other big economies. Rotten infrastructure loads unnecessary costs on businesses. In Mato Grosso a soyabean farmer spends 25% of the value of his product getting it to a port; the proportion in Iowa is 9%. These problems have accumulated over generations. But Ms Rousseff has been unwilling or unable to tackle them, and has created new problems by interfering far more than the pragmatic Lula. She has scared investors away from infrastructure projects and undermined Brazil’s hard-won reputation for macroeconomic rectitude by publicly chivvying the Central Bank chief into slashing interest rates. As a result, rates are now having to rise more than they otherwise might to curb persistent inflation. Rather than admit to missing its fiscal targets, the government has resorted to creative accounting. Gross public debt has climbed to 60-70% of GDP, depending on the definition—and the markets do not trust Ms Rousseff. Fortunately, Brazil has great strengths. Thanks to its efficient and entrepreneurial farmers, it is the world’s third-biggest food exporter. Even if the government has made the process slower and costlier than it needed to be, Brazil will be a big oil exporter by 2020. It has several manufacturing jewels, and is developing a world-class research base in biotechnology, genetic sciences and deep-sea oil and gas technology. The consumer brands that have grown along with the country’s expanding middle class are ready to go abroad. Despite the recent protests, it does not have the social or ethnic divisions that blight other emerging economies, such as India or Turkey. A reportagem principal pode ser lida na íntegra AQUI. Mas não é só isso: na reportagem especial, que totaliza 14 páginas, há diagnósticos precisos sobre a deplorável infra-estrutura sucateada pelo PT em mais de 12 anos (chamada pela revista, muito acertadamente, de “road to hell”), crítica aos gastos exorbitantes e burros com estádios de futebol, análise ponderada sobre agronegócios, indústria, bens de consumo… Enfim, um mapeamento bastante completo, acurado. E, assim sendo, uma reportagem que não deixa nenhuma sombra de dúvida sobre a brutal incapacidade intelectual, política ou gerencial do poste Dilma Rousseff. Assinantes podem acessar a reportagem completa AQUI.